Early reports had suggested, as Fortune notes, that the iPhone 5c might not be selling quite as briskly as the 5s. The 5s is likely still outselling the cheaper device, but reports of lots of stock for the 5c may have had much more to do with it being well-supplied than with any significant lack of consumer interest, based on these figures. 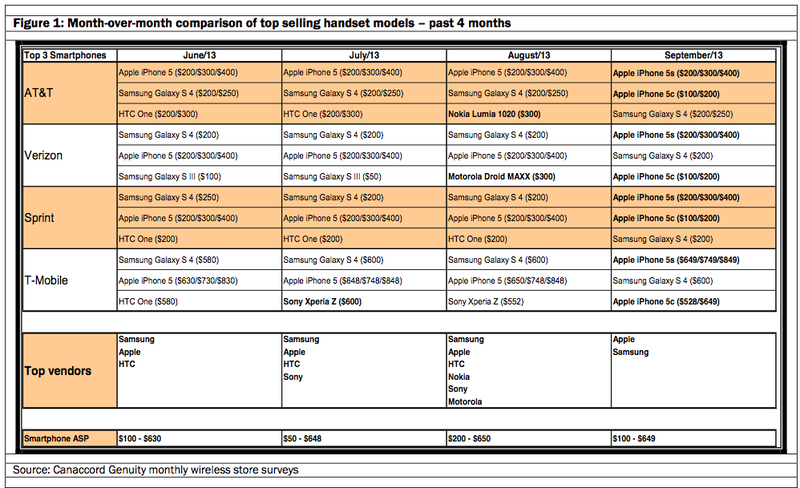 Samsung managed to retain second place at both Verizon and T-Mobile with the Galaxy S4 despite Apple’s iPhone launch, due in part to price cuts, according to Canaccord. Despite hanging on to those positions, the bottom line here is very promising for Apple, which has shown that it can put forth a strong showing not just with a top-tier device, but also with a lower cost option which retains most of the internal tech of the last generation iPhone with a cosmetic update that likely actually results in lower costs to manufacture. So not only is Apple probably selling more of these compared to previous last-gen offerings, like the iPhone 4s when the 5 remained on the market, it could be clearing greater profit on each sale, too. These are early numbers from a single source, covering only the U.S., but they indicated along with Apple’s record-breaking first weekend sales that the iPhone 5c strategy is really working well for Apple at the outset. If this continues to be the case, and has similar effects around the world in other key markets, I wouldn’t be surprised to see Apple adopt similar tactics across its other product lines, too, including the iPad and possibly the Mac.